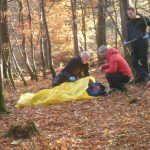 Tollymore National Outdoor Centre has been delivering First Aid Courses for mountaineers and canoeists for more than 40 years. We use the Rescue Emergency Care Scheme for all our courses; a tried and tested practical approach to first aid, giving our students real confidence to deal with situations in remote environments. We offer a wide range of courses, from one-day basic courses to advanced and trainers. Whether you are attending for personal use or as a leader of outdoor sports, we will have a course to meet you and your governing body requirements. If we don’t, just ask and we will provide a tailored course to meet your needs. All our staff working on our courses are fully qualified REC trainers with a background in adventure sports at all levels.